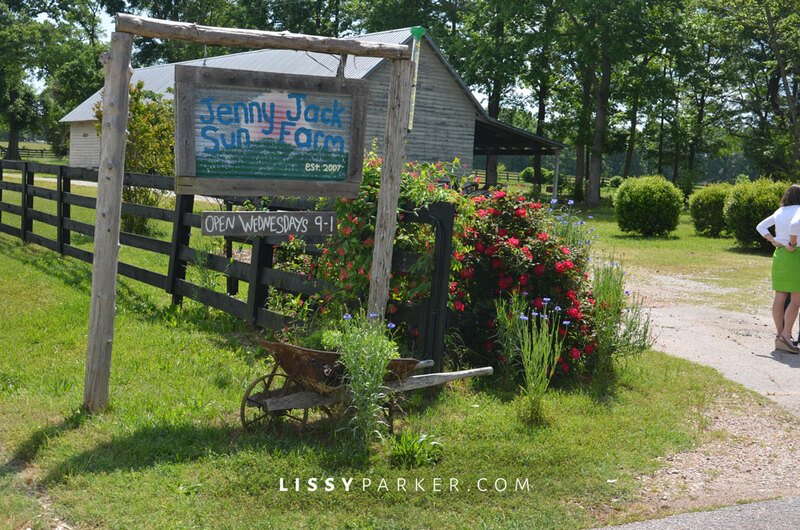 Welcome to Jenny Jack Farm. The welcome center is where the tour begins. Buff Orpington chickens roam the property and provide fertilizer for the garden. My garden club headed to Jenny Jack Farm for a recent field trip. This sunny piece of earth is near Pine Mountain, Georgia and the beautiful Callaway Gardens. A new generation of organic farmers is changing the look of farming. This garden is on only four acres—and yet the results are amazing. The gardening show Growing a Green World recently featured this interesting farm—watch the episode here. Our tour continued at the farm of a fellow club member nearby. Her raised-bed gardens are set on a terraced field and the property includes the most charming chicken coop and barn—yes, chicken coops and barns can be charming. Have a little field trip of your own today and enjoy the photos! The barns were so charming—love the black fence. The vegetables filled every acre of the property. The onions and garlic were almost ready for harvest. The Swiss chard was ready for my salad. Having great friends along for the trip was the best! We also toured a private home and garden in the area. This kitchen was my favorite room—brick walls and stainless steel. I need those lights and that refrigerator! How lucky the chickens who live here! Climbing roses, rosemary and lavender surround the coop. The whole garden is raised and surrounded by a stone wall and fence. Beautiful greens are ready to pick and enjoy. Even the barn was beautiful. I love rosemary and this garden had it in abundance. Water gardens were near the windows and paths. How refreshing is this pool on a warm Summer day! Wisteria shades the pergola—I need one of these! What a beautiful tour to start my day! Love seeing the gardens – vegetable gardens have never looked so perfect and the chicken coop…adorable! That chicken coop was so adorable—and smelled heavenly. Those are very lucky chickens. Lissy, I love this farm!!!! Thanks for sharing these wonderful photos! Jenny Jack Farms looks LOVED! What a beautiful day you all had! I love your friend’s farm with the charming barn and amazing chicken coop. Her raised beds are wonderful too. Thanks for taking us along!